We hate to do this to you since you’re probably still in recovery from last night’s Season 14 finale of Grey’s Anatomy, but prepare for more waterworks, superfans. 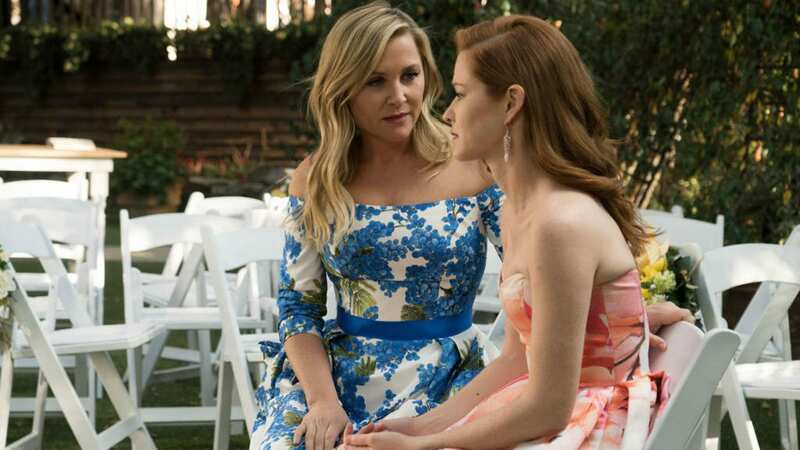 After the tear-jerking episode aired, stars Jessica Capshaw and Sarah Drew revealed what their last official day of filming was like — and how the rest of the cast commemorated the end of the era of Dr. Arizona Robbins and Dr. April Kepner. ICYMI, Grey’s pulled a shocking stunt during the finale and didn’t kill off Arizona and April. This is clearly outside the norm for the medical drama, which has sent more than a few fan favorites to that big hospital in the sky, so to speak. However, in a touching, fitting tribute to how much Capshaw and Drew (and their characters) have meant to the series and its fans, showrunner Shonda Rhimes showed rare mercy. Instead of seeing catastrophic deaths to end Arizona and April’s time at Grey Sloan Memorial Hospital, fans got to see them get their happy endings. Not surprisingly, their upbeat fates elicited all the feels (read: tears, lots and lots of tears). And, as if you hadn’t cried enough already, the stars took to social media to share their beautiful goodbyes. Drew posted a photo of the “extraordinary” moment the cast and crew presented the now-former Grey’s actors with memory boxes full of pictures and letters. And a big thank-you to all of her fans. And lastly… I can’t sign off without thanking all of YOU guys! The Grey’s Anatomy fans are some of the most passionate people I’ve ever encountered. Thank you for the years of encouragement and engagement and love. You are a FORCE!!! I love you! Capshaw shared a whole slew of behind-the-scenes photos, videos, tributes and insight on her feed. Grab a box of tissues and head over to Capshaw’s Instagram. Don’t hesitate to ugly-cry your eyeballs out — if anyone on Grey’s appreciated a good sobfest, it was April and Arizona. So, it’s only fitting, right?